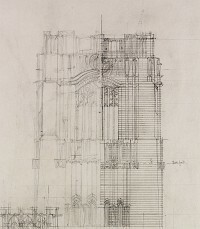 This was Honeyman, Keppie & Mackintosh's unsuccessful entry in the first round of the architectural competition for Liverpool's Anglican cathedral. Had it been carried out, it would have been Mackintosh's largest and most ambitious building, and one of the most individual products of the Gothic Revival. Authorship: The design was submitted anonymously on behalf of Honeyman, Keppie & Mackintosh, but correspondence between Mackintosh, Margaret Macdonald and Hermann Muthesius confirms that Mackintosh was the partner responsible, and it was published under his name in 1903.